My Born Pretty Store haul- Jewellery again! Born Pretty Store is an all time favourite place for me to shop for trendy accessories! They have a marvellous collection of everything (yes, everything) Everytime I intend to check out the other things but land into the jewellery section, thanks to all the bling! This time I picked up a couple of neckpieces and a ring set. This emerald and lime green necklace was love at first sight while I chose the two layered golden necklace for casual occasions. The former can add the perfect pop of colour to any outfit by adorning your neck. The ring set was a catchy one with beautiful delicate rings in various shapes and sizes. However, they started to turn slightly copper in colour after wearing not more than two times. I was disappointed to see that but keeping the price in mind, couldn't expect them to last long. Born Pretty Store does have a collection of rings with price on the higher side so if you want these trendy pieces in your collection and want them to last long, you should go for those. I've already worn these pieces in some of my recent OOTDs (HERE and HERE), you can take a look at the closeups. 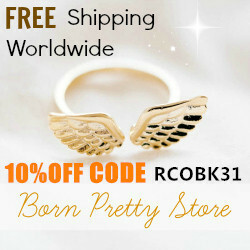 Born Pretty Store has been kind enough to provide a 10% off coupon code RCOBK31 which you all can use during checkout and save some more pennies!